Uniworld’s first river cruise itinerary through India is as extensive as it is exotic. Illustration courtesy of Uniworld Boutique River Cruise Collection. 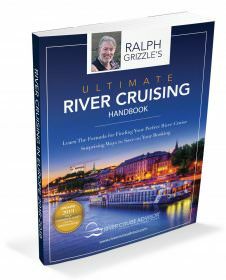 India River Cruises are increasingly coming on line with several companies that now offer Ganges River cruises, including Uniworld, Vantage, Voyages Jules Verne, and APT Touring, to name a few. Points of interest on India river cruises vary by company, but some include a visit to Mother Teresa’s orphanage and home in Kolkata, the one of a kind Taj Mahal, and the cultural village of Mayapur, just to name a few. India can be overwhelming and intimidating for travelers, but with a river cruise, it’s easy to see the sites and relax. Locally inspired cuisine allows you to taste the flavors of the country while socializing with fellow passengers. A Ganges river cruise is a truly ideal way to see India with ease. Take in the stunning scenery of villages and countryside while sailing aboard a comfortable boat, complete with all the amenities you will need. With a blend of history, religion, and daily life, you will come away with a greater understanding and appreciation for this colorful, dynamic country. In 2016, Uniworld Boutique River Cruise Collection will introduce its first luxury cruises along India’s famed Ganges River. The 13-day India’s Golden Triangle and the Sacred Ganges cruise tour will be operated aboard the brand-new, 56-guest Ganges Voyager II. Travelling from New Delhi to Kolkata, guests will first explore India by land, with two nights in India’s sprawling capital city. From there, guests travel to Agra where they can choose to watch the sun rise over the famed Taj Mahal before setting out for Jaipur. After two nights in Jaipur, guests fly south to Kolkata for a week-long voyage up the Ganges aboard the Ganges Voyager II. 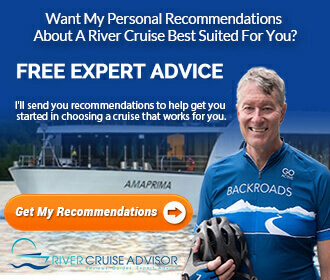 Want To Experience India River Cruises? Our vote goes with Uniworld’s 13-day itinerary that traverses the exotic and complex country of India – one of the first of its kind to be offered by a North American-based river cruise line. Debuting in January 2016 aboard the newly built Ganges Voyager II, this is the river cruise for those looking for something far removed from the “ordinary” voyages along the Danube. 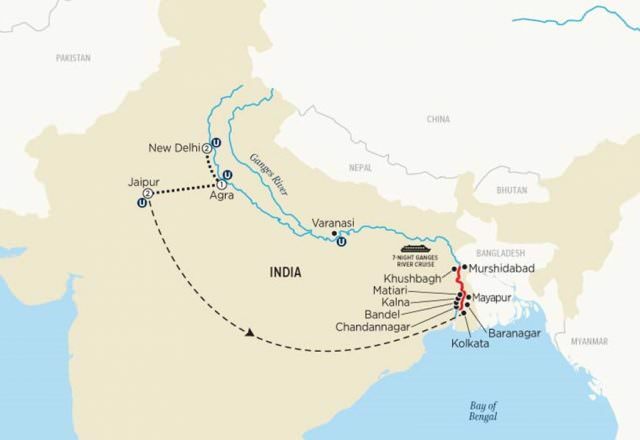 Read more about Uniworld’s Ganges river cruises: India’s Golden Triangle & the Sacred Ganges. Uniworld’s high-standard of luxury has transferred over to the overland experience as well: Guests will stay in Oberoi Hotels for the duration of their land-based programs. Oberoi is a luxury hotel group headquartered in Delhi that is famous for its opulent hotels and high standards of service. If you’ve always wanted to see India but have been put off by the thought of having to arrange all the details yourself, Uniworld’s new, fully-escorted river cruise tour is possibly one of the best ways to experience all that India has to offer. Assam Bengal Navigation. Co (ABN) is their river cruising operator partner in India on the Ganges & Brahmaputra Rivers. In celebration of their coming 15th year (in 2018) of pioneering river cruise operations in India, they are introducing special new itineraries, new promotions and better yet, also their 4th river vessel in November 2018. PS- They also cruise all the way across the famous Varanasi Ghats. It was an incredible experience!